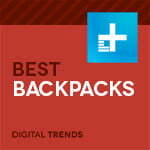 Shopping for a new backpack can be a daunting task. First, you need to decide what type of pack you want based on the kind of hiking you intend to do. Next, you have to wade through a laundry list of features, some of which prove useful on the trail while some are more hype than helpful. To help, we sifted through the sea of available options to carefully select a variety of our favorite backpacks for a range of different hikers. Whether you want a lightweight daypack for fast summit treks or an oversized backpack for multi-day trips, our recommendations make it easy to find the best backpack possible. Why should you buy this: The new Rotaglide hip belt suspension of the Arc’teryx Bora AR 50 looks poised to revolutionize the outdoor industry by bringing a new level of comfort not yet seen in a high-capacity backpack. Who’s it for: The Arc’teryx Bora AR 50 is for the hiker who wants it all — convenient storage, waterproof design, and the ultimate in comfort thanks to the company’s new pivoting hip belt that moves along with you. Arc’teryx shook up the outdoor gear industry in 1994 when it first introduced its Bora backpack with a Thermo-molded back panel and hip belt. Now, 23 years later, the company upended the marketplace yet again with its new Bora AR 50, a revolutionary pack that uses a pivoting hip belt to take the pain out of long distance backpacking. The new RotoGlide hip belt fits into the frame of the pack using a ball joint which allows the belt to pivot left, right, up, and down. Instead of having the pack shift when you move, the belt moves with you as you step, pivot, or bend, providing a range of movement and comfort unrivaled by traditional hip belts. It’s like nothing else on the market and leaves you wondering how you ever carried a heavy load using a conventional hip belt system. If this isn’t enough comfort for you, the Bora AR features the company’s signature Tegris back panel that moves the pack away from your back for improved ventilation. The Thermo-molded shoulder straps also have a two-point adjustment system that can be dialed-in to fit any torso length or shoulder width. Even in the heaviest of rains, the Bora AR 50 keeps your clothing and gear bone dry thanks to the pack’s outer waterproof material and companion waterproof zippers. For convenience, Arc’teryx includes a zippered kangaroo pocket on the back panel, two stretchy hip belt pockets that fit most modern cell phones, and straps on the back for trekking poles or an ice axe. The large top loader has two interior pockets for smaller items and a side zipper for easy access to items stored at the bottom of the pack. The Arc’teryx Bora is available in both men’s and women’s styles with the 50L men’s model weighing in at 4.8 pounds. Why should you buy this: The North Face Summit Alpine 50L is the lightest mountaineering pack on the market with a sleek minimalist design suitable for both rock and ice climbing. Who’s it for: Alpine enthusiasts who spend their time climbing rock faces and ice walls. Part of its Summit Series, The North Face designed its Summit Alpine 50L for alpine pursuits that take you to extreme environments. At only 2.5 pounds, it’s the lightest pack in its class and is the first piece of gear in the company’s Summit Series to use a fused fabric design, providing unrivaled durability when scaling rocks or ice. This FuseForm construction weaves together 70-denier and 40-denier Cordura nylon into a single fabric used in the construction of the pack. This combination of materials provides the Summit Alpine 50L with excellent abrasion resistance as well as a significant amount of breathability. By fusing the fabrics, North Face also reduces the number of seams which improves its overall water-resistance and durability. 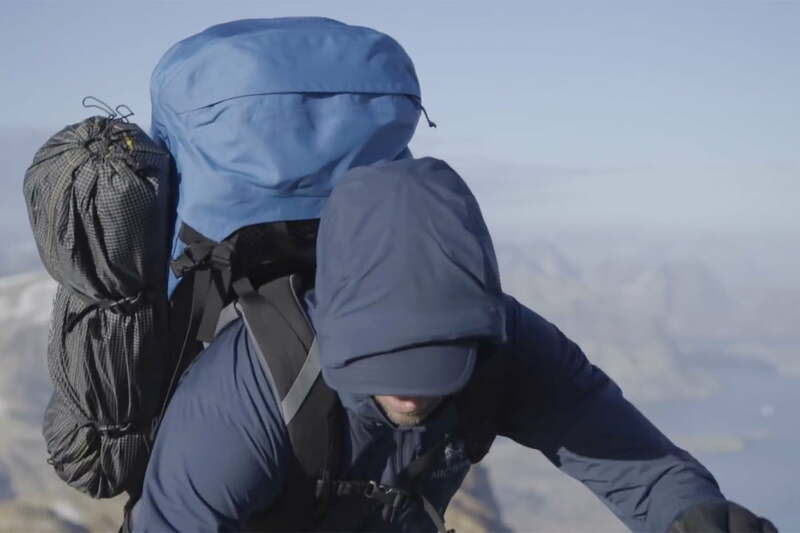 Because of this unique construction, the Summit Alpine 50L is light and strong — a rare combination. Looking beyond fabrics, the Summit Alpine 50L offers a padded, contoured waistband that’s removable when needed during challenging ascents. There’s also a curved back pad that hugs the body and provides a comfort unmatched by a straight back pad. The shoulder strap also curves inward to fit your arms, allowing for unrestricted movement. For storage, the Summit Alpine 50L has a roomy interior with a pull-close top lid that doubles as a rope carry system. 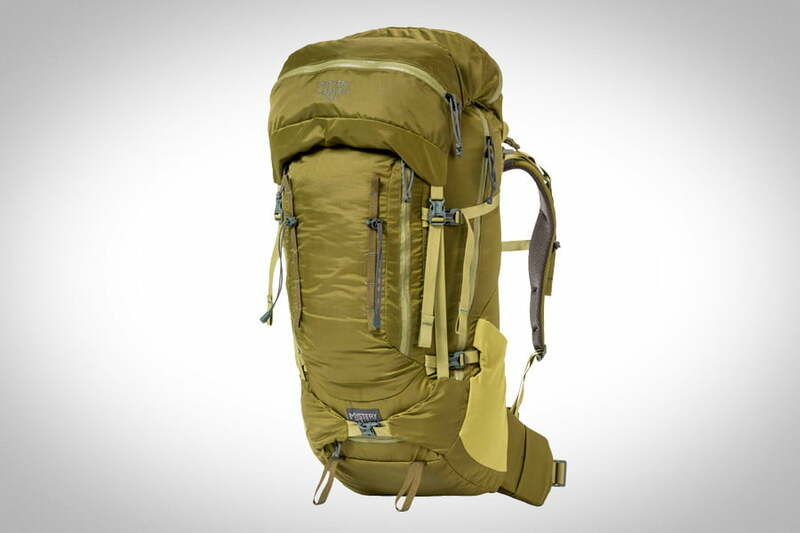 For those keeping track of weight, the Summit Alpine 50L weighs 2 pounds and 9 ounces. Why should you buy this: No matter the terrain, the Exped Skyline 15 provides the utmost in comfort thanks to the pack’s versatile suspension system that’s adjustable on the fly. Who’s it for: Dy hikers looking for a lightweight pack with plenty of pockets and a comfortable fit want the Exped Skyline 15. The Exped Skyline 15 is a panel zip backpack with all the amenities you’d expect in a pack suitable for a day on the trail. Multiple internal and external pockets make it easy to organize your gear, while attachment points on the outside allow you to carry trekking poles or an ice axe. Two hip belt pockets provide a place to store essentials like a camera, snacks, or lip balm. The Flagship feature of the Skyline is the switchback suspension system that’s adjustable based on the terrain. At the heart of the Switchback suspension is the Switchband, a flexible piece of mesh-covered fabric which extends down the back panel of the pack and attaches via a velcro strap. When a stretch of technical terrain requires a close-fitting pack, relaxing the Switchband allows the pack to lie close to your back. When maximum ventilation is desired, tightening it bows the internal frame and lifts it off your back. To make the Skyline as comfortable as possible, Exped added light padding to the shoulder straps and hip belt, covering them with a breathable mesh which wicks moisture from the body. As an added bonus, the mesh dries quickly if the pack gets wet from any rain. The Exped pack also boasts a hydration bladder hanger with a dedicated pouch to keep it separate from gear in case of a leak. Like most good packs, there’s an opening on the backpack near the shoulder straps and two holders on the shoulder strap that route the drink tube to a location convenient for hands-free drinking. When it rains, there’s a zippered pocket on the bottom that holds an integrated rain cover for the pack. The Exped Skyline is available in both 15L and 25L capacities, both of which are suitable for a day hike. The Exped Skyline 15 weighs 37 ounces and comfortably holds up to 26.5 pounds. Why should you buy this: Hikers who want to go light but don’t want to sacrifice features will fall in love with the Granite Gear Crown 2 60L. Who’s it for: The Granite Gear Crown 2 is the perfect pack for the no-compromise hiker who wants a robust feature set in the lightest possible pack. Every major feature in the Granite Gear Crown 2 focuses on reducing weight — and it shows. Starting with its fabrics, Granite Gear cut weight by using 100-denier high-tenacity nylon, plain-weave nylon, and 210-denier High-Tenacity ripstop Nylon for its construction. To support the pack, Granite Gear uses a molded polypropylene frame sheet with die-cut holes whose sole purpose is to minimize pack weight. This frame is completely removable if you need to shed even more. The weight savings from this construction is significant as the Crown 2 tips the scales at a mere 2.1 pounds, compared to the 4- to 5-pound weight of most standard backpacking packs. This sleek design gives the Crown 2 one of the best volume-to-weight ratios on our list. Don’t be fooled — the Crown 2 may be lightweight but that doesn’t mean it isn’t feature-rich. The Crown 2 features a redesigned top lid with DWR-treated zippers. The lid is spacious enough to hold extra gear for longer treks but can be removed when a lighter load is preferred. With a front stretch-mesh pocket and stretch-mesh woven pockets on the sides, there’s no shortage of storage space on its exterior. When packed to the max, the Crown 2 also carries an impressive 35 pounds. Why should you buy this: The latest backpack from Osprey combines the comfort of the company’s Anti-Gravity suspension systems with the convenience of Osprey’s spacious design. Who’s it for: Backpackers looking for a ventilated pack that comfortably carries heavy loads should look no further than the Osprey Ariel for women. 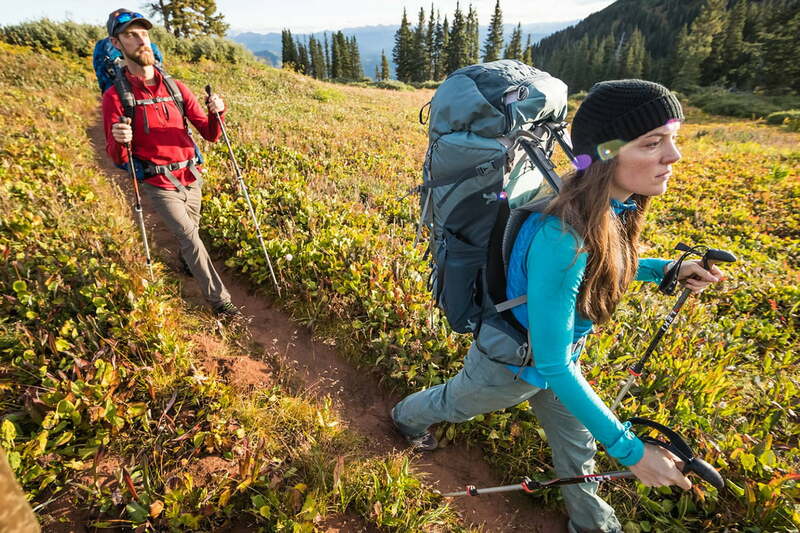 Designed for backpacking and thru-hikes, the women’s Ariel pack is a long-time favorite in Osprey’s lineup because of its custom fit and convenient layout of pockets. The keys to this custom fit are the pack’s IsoForm5 harness and CM hip belt; both of which are interchangeable. The ability to swap out sizes allows you to find the perfect fit while carrying heavy loads. The 2017 Ariel model improves upon this flexible fit with the addition of the industry-leading Anti-Gravity suspension. The AG technology uses a suspended mesh panel that extends the length of the torso. This panel allows the pack to hug the wearer and evenly distribute its load on a person’s hips and back. When you add in the women-specific styling, the result is a super customizable fit that lets you remain comfortable even while carrying a heavy load. Not only is it comfortable to wear, the Ariel is also packed with features that are indispensable on the trail. The top lid removes and converts into a full day pack outfit with a sternum strap and a sleeve for a hydration bladder. The backpack also boasts a large main compartment that sits on top of a sleeping bag compartment with a removable divider. This compartment is accessible from both the top and the side. For quick storage, it also has dual side mesh pockets and one large mesh pocket on the back panel. Certainly not an ultralight option, the Osprey Ariel 55AG weighs 4.883 pounds. It also is available in a men’s style as the Osprey Aether. Why should you buy this: The Stein 62 from Mystery Ranch converts from a backpack to a day pack in a matter of minutes, making it your go-to pick for long day hikes or weekends on the trail. Who’s it for: Hikers who want a single bag with ample storage space and the versatility of a built-in daypack will appreciate the Mystery Ranch Stein 62. Founded by Dana Gleason of the former Dana Design, Mystery Ranch is no stranger to the backpack industry. The company prides itself on its load carriage technology, which focuses on how a pack feels and responds when fully loaded. The result of this focus is a form-fitting telescoping harness that adjusts to fit your exact torso size. Add in the unique lumbar wrap that shifts the weight perfectly onto your hips and you have a pack boasting a custom fit to a variety of torsos and hiking situations. The Stein 62 screams comfort and convenience. Aside from the weight-transferring hip belt, there’s also a padded back panel with lumbar support and padded shoulder straps that are curved to allow a free range of motion in the arms. The top loader has a side access zipper and two outer pockets that are angled to maximize the amount of gear they’re able to hold. One of the flagship features of the Stein 62 is its two-pocket top lid. Incredibly spacious, these allow you to store essentials like a puff jacket, cooking supplies, or other items frequently used while hiking. When you reach basecamp, the top lid removes quickly from the pack and converts into a day pack. Unlike other convertible daypacks, the Mystery Ranch Stein allows you to take off your straps from your main pack and attach them to your day pack. It takes a few minutes for this transfer but the investment in time is worth it, as the resulting pack is extremely comfortable to wear. The 62-liter Mystery Ranch Stein weighs an industry average 4.7 pounds. Why should you buy this: With its frameless, bombproof construction, the Zpacks Nero is the poster child for the minimalist backpacker. Who’s it for: Hikers looking for an ultra-lightweight backpack that’ll stand up to rain, rocks, and more will want to add the Zpacks Nero to their arsenal. 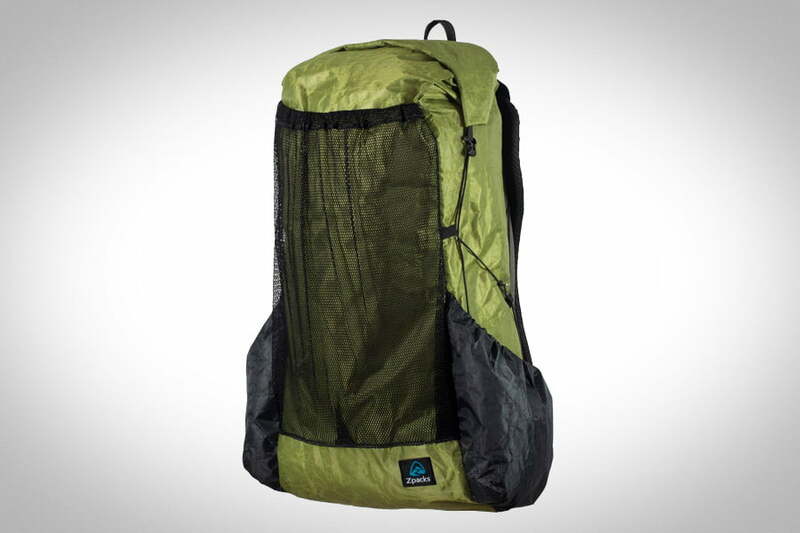 When all you need is a basic stuff sack, the Zpacks Nero should be your first choice. Replacing the popular Zero model in Zpacks lineup, the Nero has near zero unnecessary pockets or options. This ultra-minimal option is a simple 38-liter pack but you’re able to add extras such as a removable shoulder pouch or belt pouch for versatility. The Nero offers a frameless design, making it ultra light as well as minimal. The only thing giving it some rigidity is a piece of closed cell foam that also functions as a sit pad. The newest iteration weighs a feather-light 10.9 ounces (11.9 if you count the foam sit pad) and is capable of carrying up to 20 pounds, with a target weight of 5-6 pounds. However, ultralight doesn’t mean ultra-wimpy. The Nero is constructed using Dyneema Composite Fabric (2.92 ounce per square yard) which sandwiches Dyneema fiber filaments between layers of 50 denier polyester film. These alternating layers are melded together using a high-pressure autoclave. The resulting fabric is a fantastic composite material stronger than Kevlar, extremely lightweight, and waterproof. Originally used for boat sails, the Dyneema Composite Fabric made its way into backpacks, tents, and tarps. The Nero may lack the bells and whistles of competing packs, but it has all the essentials you need. The main pack is 25L with a flap closure to keep your gear dry. On the front is a single 8L mesh pocket both for drying wet clothing and quick access to essential items. There are two side pockets (2.5L each) that can hold up to a 1.5L bottle and are slanted for easy removal. You also can use the side pockets, along with side compression strap, to hold trekking poles. Zpacks realizes the Nero may appeal to a wide variety of consumers and can’t be a one-size-fits-all pack. The pack has three belt attachments positions allowing the owner to size the pack to their torso. The belt can be trimmed down to fit smaller waists or even removed completely. Though the waist belt is adjustable, the shoulder straps are deliberately stationary due to the frameless design, which benefits from having the straps level with the top of a person’s shoulder. These straps are padded for comfort and feature an adjustable sternum strap.